The Bergerac wine region in SW France takes its name from the 11th Century town of Bergerac which is situated on the banks of the Dordogne River 175 km from the Atlantic Coast and 590 km southwest of Paris in the Dordogne Department in the Administrative Region of Aquitaine. The Dordogne is one of the great rivers of France. It arises in the Massif Central and flows westwards to Bordeaux where it joins with the Garonne to make the Gironde Estuary leading to the Atlantic. The Dordogne was essential for the transportation of Bergerac wines in the past by “Gabares” which are large flat-bottomed boats used for taking wine barrels down river en route to foreign markets. Now tourists are the cargo of choice. The river has also created the rich alluvial river valley soil which along with other geological and climatic elements has created excellent wine growing conditions. The Bergerac wine region adjoins the Bordeaux region, one of the best known wine areas of the world. After much debate about the boundaries for the Bordeaux region, it was decided in the early 20th Century that they would coincide with those of the Gironde local government department. This left the Bergerac wine area outside these limits yet with many of the same or similar geological and climatic characteristics. For many years, Bergerac has been in the shadow of its famous neighbour and this has affected its position in the market place. Fortunately, due to the determined pursuit of quality and the consistent efforts of dynamic wine makers in the region, this lack of confidence is diminishing and the excellent wines that are available from this area are gaining greater recognition. 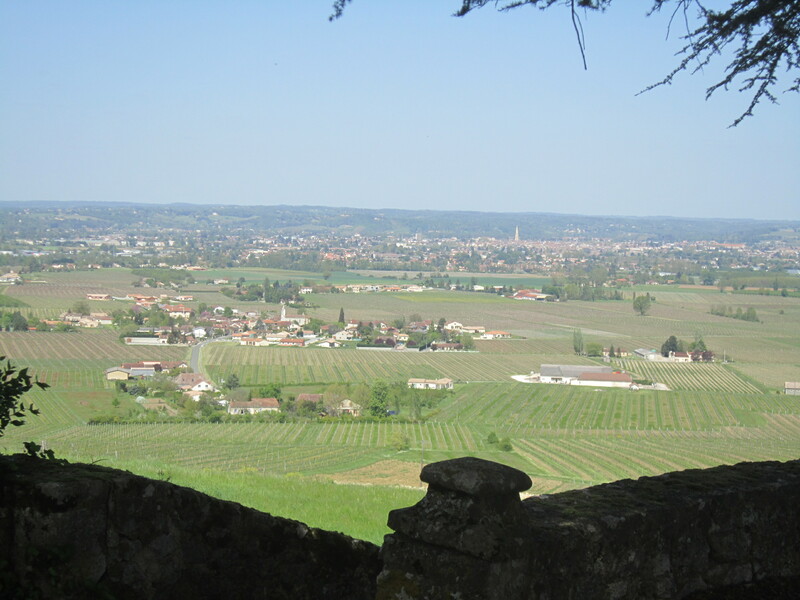 At the western edge of the Bergerac wine region, the vineyards are a continuation of the Bordeaux Côtes de Castillon and St. Emilion on the right bank of the Dordogne and the Entre-Deux-Mers south of the river in terms of vine growing conditions. The geology within the region varies for each of the individual Appellation d’Origine Controlée areas. The geological possibilities are sandy clay, limestone, iron-rich clays, gravels, clay-limestone, Agenais molasse and some specific areas have marl and clay soils with fossilized oyster deposits. Climatically, the Bergerac region has a less maritime and more continental climate than Bordeaux. It has marginally less rain and more sunshine and has about a 10 day longer ripening season which can be critical in some years. 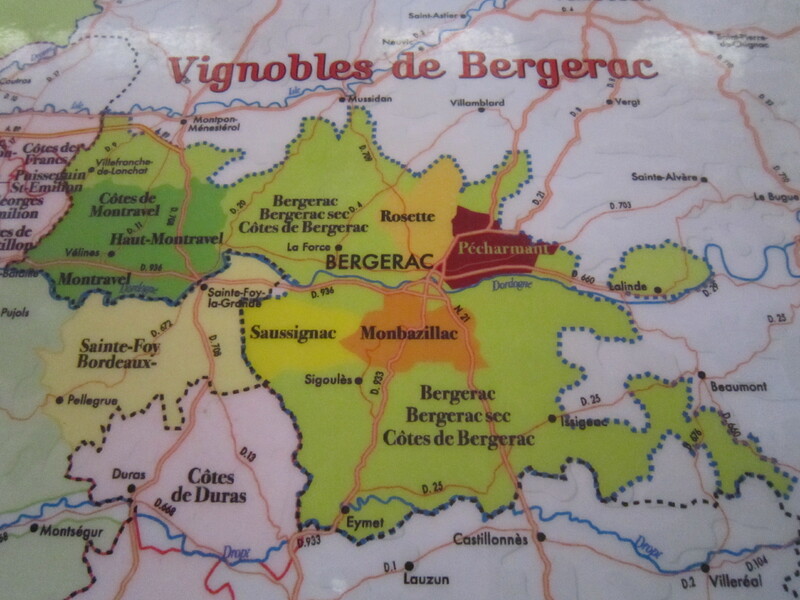 Key facts about the Bergerac wine region are that it has approximately 12,000 hectares under vines, encompasses 93 villages and has approximately 1,000 wine makers creating wine in accordance with Appellation d’Origine Controlée (AOC) guidelines. Each AOC has its particular requirements as to vine planting density, alcoholic content, grape varieties and blends and so on. The AOC is identified on bottle wine labels. Increasing numbers of wine makers are following organic wine making practices which may have more stringent demands. Easy drinking, young wines known as vins de plaisir are made in the area as well as vins de terroir which are richer, more structured and generally aged longer. Similar to the Bordeaux area, the red grapes are Cabernet Sauvignon, Merlot, Cabernet Franc and Malbec and the same varieties are used in rosé wines. The white grapes are Semillon, Sauvignon Blanc, Muscadelle and in some areas small amounts of Pinot Gris and Chenin Blanc. The wines are paired with local produce and favourites such as duck, foie gras, various pâtés and cheeses together with local vegetables and fruits, all sold in the colourful and popular street markets. The Bergerac wine region is picturesque and characterized by hills, forests, fortified villages and towns (Bastides) and is agricultural with vineyards, plum and apple orchards, walnuts and more recently sunflowers. In addition to producing quality wines and other produce, the area has a rich and varied past. Gallo-roman remains from the 1st Century A.D. have been found locally. More recent history includes the Hundred Years War (1337-1453) between the French and English regarding English claims to Aquitaine; the Wars of Religion between Catholics and Protestants or Huguenots in the 16th and 17th Centuries and the World Wars 1 and 2. For most of WW 2, the Bergerac area was in the “Free Zone”. The Hundred Years War began and ended in Aquitaine within a 80 km radius even though it included well known battles in other parts of France – think of English King Henry V and Agincourt (1415): “Once more unto the breach, dear friends, once more…” (Shakespeare: Henry V). Even though the English were finally defeated in 1453, the area has been popular with English people for many years. 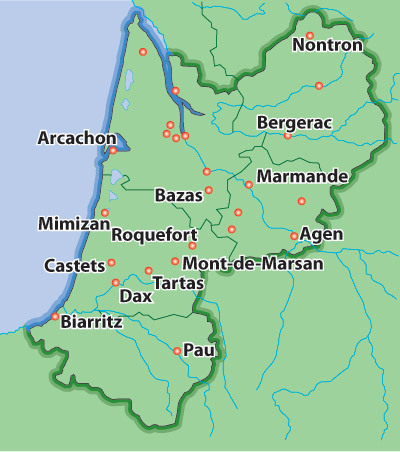 Bergerac became a protestant stronghold during the 16th Century and established wine trading links with protestant countries, especially when Huguenots from the area fled to other protestant northern European countries in the 17th Century. Holland remains a key market today for Bergerac wines. As always, historical context informs not just the past but also the present. On a recent visit to the area, we had the opportunity to visit 5 wine chateaux/wineries and they and their wines will be featured in upcoming weeks. 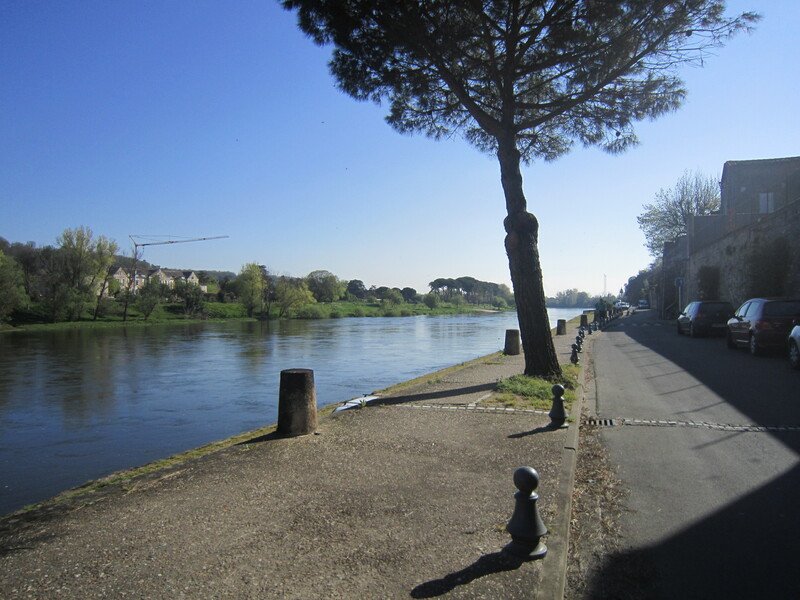 This entry was posted in culture, History, wine and food, wine tasting and tagged Bergerac wine region, French Wines, South West France, wine and food pairing, wine tasting notes by elizabethsvines. Bookmark the permalink. An interesting article and very informative. I am fascinated to read about the history and origins of the wines we uncork at our tables. You put it nicely when you said, “As always, historical context informs not just the past but also the present.” So true. I would love to taste some Bergerac wines, preferably on location, paired with local produce. Thank you for another excellent article. I find it extremely interesting to learn about all the different regions and the wines that emerge from them. Great job and I look forward to learning more about the Bergerac wines!